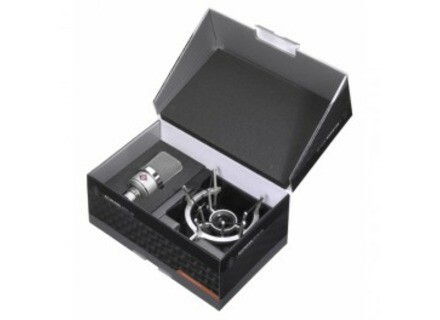 TLM 102 Studio Set, Large diaphragm condenser microphone from Neumann in the TLM 102 series. Neumann and Apogee have announced the release of a bundle including the Neumann TLM 102 large-diaphragm microphone and Apogee Duet audio interface. The cheapest of Neumann's true condenser microphones, Neumann's TLM 102 is said to offer a very harmonic, natural and detailed sound reproduction with a gentle boost in the 8 to 12 kHz region and full, well-rounded bass reproduction even down to the lowest frequencies. 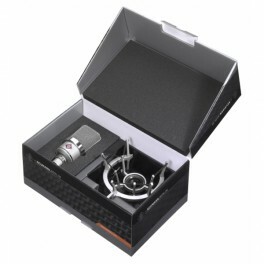 For the bundle, the TLM 102 comes complete with an EA 4 elastic suspension, so all the user needs to add is a standard microphone cable and stand. 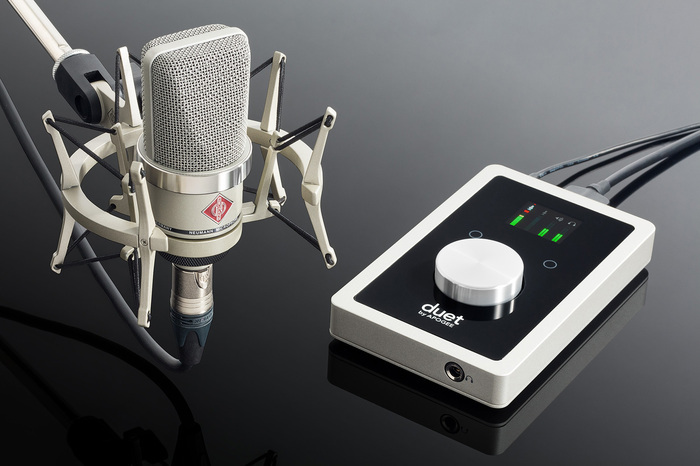 Featuring Apogee’s renowned AD/DA conversion technology, Duet is sometimes considered an industry standard for professional portable audio recording on Mac and iPad. It offers two analogue combo inputs (XLR and ¼”) with high-quality mic preamps and selectable 48V phantom power for the connection of microphones, instruments or professional line-level devices. On the output side, Duet provides two analogue 1/4” balanced outputs via the I/O port for connection to speakers or outboard equipment plus a separate, independently controlled 1/4” stereo headphone output. Via separately available Lightning and 30-pin cables, Duet can make a direct connection to iOS devices (iPhone, iPad or iPod touch). Starting in April 2016, the TLM102 Duet bundle will be available in the USA, Canada, Germany and the UK or online through Neumann's website. No MSRP announced yet. [NAMM] [VIDEO] Manley ELOP+ & Nu Mu Manley Labs present their new ELOP+ and Nu Mu compressors from their booth at the NAMM. [NAMM] Manley presents the ELOP+ Manley has introduced the ELOP+, a new version of their classic ELOP studio optical compressor and limiter. [NAMM] Shure presents KSM8 Dualdyne Shure has introduced the KSM8 Dualdyne, the world's first dual-diaphragm dynamic handheld microphone.